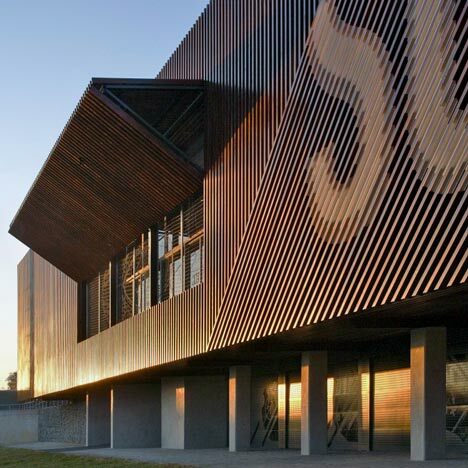 Canadian practice RUFproject have completed a football training centre in Soweto, South Africa, with wooden louvres wrapping the upper parts of the structure. Designed in conjunction with Nike Global Football Brand Design, the exterior walls of the rectangular building are rendered in local sandstone. The upper part of the building overhangs the lower, providing shaded areas for players between matches. Located on the ground floor, the gym and catering area face the pitch and have moveable screen façades, opening them up to the field. The facility comprises two full-sized pitches, two smaller ones, a clubhouse, player lounge, offices, viewing deck, gym and changing rooms. Photographs are by Julian Abrams unless otherwise stated. Situated in the heart of Soweto, the Football Training Centre is the centre of football in South Africa, where 1200 teams and 20,000 footballers play each year. In less than 6 months, the facility was transformed into a state of the art football training centre - the first of it’s kind in Africa, and the rest of the world. Designed by the Canadian firm, RUFproject in conjunction with the Nike Global Football Brand Design, the facility encompasses 2 new full sized artificial pitches, 2 junior turf pitches, new lighting, a clubhouse & player lounge, an education facility for the Grass Roots Soccer & Life Skillz program, a Training Gym, Physio & First Aid facility, a Product Trial, Catering, Administrative Offices, Viewing Deck and new Change Rooms. The Clubhouse & Player’s Lounge house regular and in-depth tips and insights from Nike Athletes & Coaches and a place for coaches and players to focus on the tactical and strategic aspects of the game. The concept was to create a clear but intricately woven relationship of spaces, linking the programmes of the facility visual and physically through "cuts" in the solid mass of the rectangular structure. Each room has views to and from other areas of the building which creates an intricate and selective transparency between functions. The facility has been design from the outset for and around the player, supporting the various aspects of their day. Everything has been considered to make the facility flow and remain open, and at the same time manage the reality of creating a secure and safe place to play football. The gym, product trial and catering functions have operable facades, opening them up to the field directly to the fields, and a player’s tunnel bisects the main building creating a direct connection from the change rooms with the field for the players. The facade is clad in a local sandstone, and wrapped with a local timber louvre structure to mitigate the solar heat gain to the west, north and east facades. Cantilevering over the pitches, the overhang provides shade before and after the game. The south facade has it’s sandstone exposed and houses a growing list of players who distinguish themselves on and off the pitch - their names permanently a part of the building and it's future. The intent of the project was to provide a lasting home for football in the dynamic neighbourhood of Soweto that would continue on past the world cup. Local Project Manager: SIP Project Managers Ltd.